Venus is a very interesting planet to study for gravity and mass momentum concepts. We know a considerable amount about Venus as we have had numerous missions to Venus including NASA's early Mariner missions, the Soviet Union's Venera probes, NASA's Magellan mapping missions, and the ESA's Venus Express. Venus is orbiting around the Sun while spinning opposite the direction of the Earth. 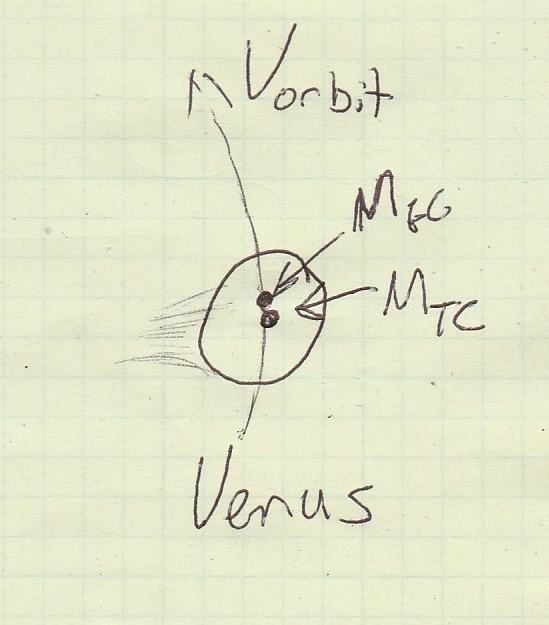 An interesting characteristic of Venus's orbit and mass momentum system is its retrograde rotation. That is Venus rotates on its axis in the opposite direction of the Earth and Jupiter as discussed previously. Venus orbits around the Sun at a distance roughly 72% the distance of the Earth. Venus also has no known moons. Its most influencial orbiting partner is the Sun. We also know that the atmosphere of Venus rotates ahead of the planet with distinct flow characteristics and speeds over 300 KM per hour. According to the European Space Agency, the findings of the Venus Express missions conclude that Venus's spin is slightly slowing. That is the Venus days are getting longer. We observe Venus to be a unique gravity and mass momentum system. We know the orbital traits of Venus such as its low orbital inclinations, small axial tilt, and low orbital eccentricity. Venus has a much smaller axial tilt ~3 degrees as compared to Earth at ~ 23.4 degrees. This leads me to conclude that Venus has more or less never had a significant orbiting partner such as a moon nor any major planetary collissions. 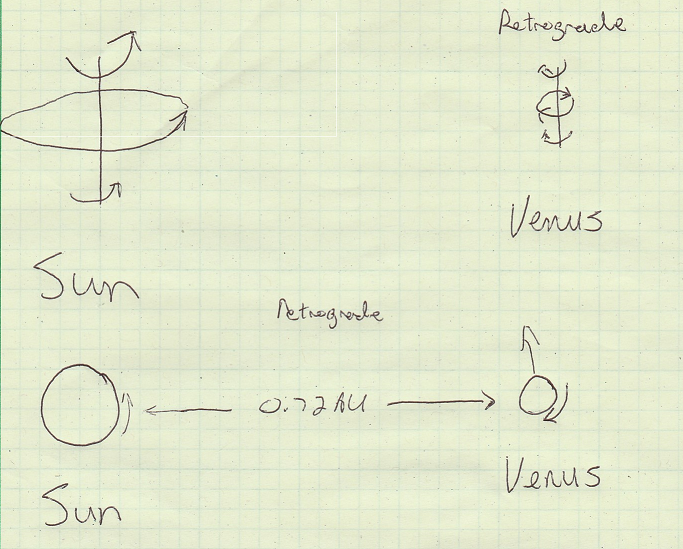 Figure 1: Illustration of Venus orbit and retrograde spin with the Sun. Let's consider our previous discussions on gravity and mass momentum where we analyze the Earth, Moon, and Sun relationship. We came to consulsions that upper jet stream motions, magnetic fields, and even certain characteristics of plate techtonics can be directly tied to the Earth's closest gravity neighbors with the Moon and Sun being a significant influence. The Sun's influence of tides and atmospheric conditions on Earth cannot be neglected. Venus is closer to the Sun so the Sun's gravitational influence on tidal and atmohspheric conditions must be amplified on Venus. Venus has no known moons, but it has a very large steady gravity partnership with the Sun. Basic gravity relationships and modeling show that the FG, force of gravity, between two objects is related to the product of the masses and the distance between them squared, i.e. FG ∝M1M2/R2. We know that FG ∝MiMSun/R2 so Mi, at a distance of Venus would see ~ 2 X the gravitational force than that same infinitesimal mass at the Earth's distance. FG due to the Sun at Venus's orbit is 1.93 times as strong as at Earth. For comparison let's analyze the Moon's gravitational effects on Mi with Earth and the Sun's gravitational effect of Mi on Venus. We know that the moon has a mass MMoon of ~ 7.3477x1022kg, and orbits at a distance of 0.00257 AU from the Earth. Using our same relationship of FG ∝MiMMoon/R2 we see that the gravitational force on Mi would have a magnitude of ∝ (1.11x1028)Mi. Now let's determine this gravational order of magnitude with the Sun on Mi at Venus. We estimate the Sun to have ~1.989x1030kg mass. We also know from above that Venus is orbiting at 0.72 AU. 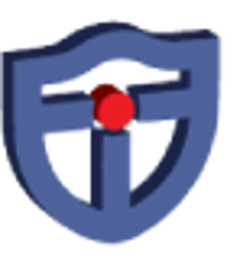 This lends FG ∝MiMSun/R2 to yield a gravitational order of magnitude on Mi of ∝(3.84x1030)Mi. That is the Sun has a greater influence on Mi on Venus than the Moon has to Mi on the Earth, thus the Sun is a significant driver of the atmosphere on Venus. We know the Moons tidal effect on the Earth and we can make the connection now to the Sun's relationship with Venus in helping to drive the Atmosphere and jet streams. Due to the symetry of the orbit for Venus this results in the smooth fast fluid jet streams that we see. Obviously the temperatures, pressures, and depths of the Venus atmosphere are part of this mass momentum engine with the Sun's constant gravitational presence. Let's now examine a more accurate depiction of gravity and mass momentum of orbiting bodies by considering the spin magnitude as well as the Vorbit, velocity of the body along its orbit. Bodies in orbit feel a slightly different center of mass from one another's point of view than their true center of mass. A body that is orbiting the Sun is travelling at an orbital velocity which keeps the body on an arc of travel around the Sun. This travel arc reality is due to the gravitational and mass momentum reality of this center of mass apparrent which keeps the body on an orbit. If the body speeds up then the gravitational center of mass moves backwards on the travel arc presenting the reality of a slightly larger orbit. If the body slows down then the gravitational center apparrent moves forward on its orbiting travel arc thus resulting in a smaller orbit. Figure 2: Illustration of Gravitational center of mass apparrent versus the true center of mass of an orbiting body. The spin of the body also affects this apparrent gravitational center of mass. If an orbiting body keeps the same Vorbit and varries its prograde or retrograde spin it will change the apparrent gravitational center of mass resulting in larger or smaller orbits. In the case of Venus above and true oscillating physics of orbit i.e. Vorbit, spin, inclination of orbit, and other characteristics are all working together to satisfy mass momentum and gravity. Further we can explain the apparrent slowing of the surface rotation and lengthening of the Venus day. As Venus is orbiting the Sun the apparrent center of Mass of Venus is more truly seen by the Sun on the lead orbiting edge however it is spinning in retrograde motion. Venus's retrograde spin is being slowed by the gravity interaction with the Sun. This means that Venus is slowly loosing momentum through lengthening of the Venus day as it travels on its orbit. If gravity and mass momentum hold true then this slowing of Venus's spin should translate to other detectable changes in Venus's orbit. We may detect as the day lengthens that Venus is also increasing Vorbit and orbiting at ever smaller or larger distances to the Sun. 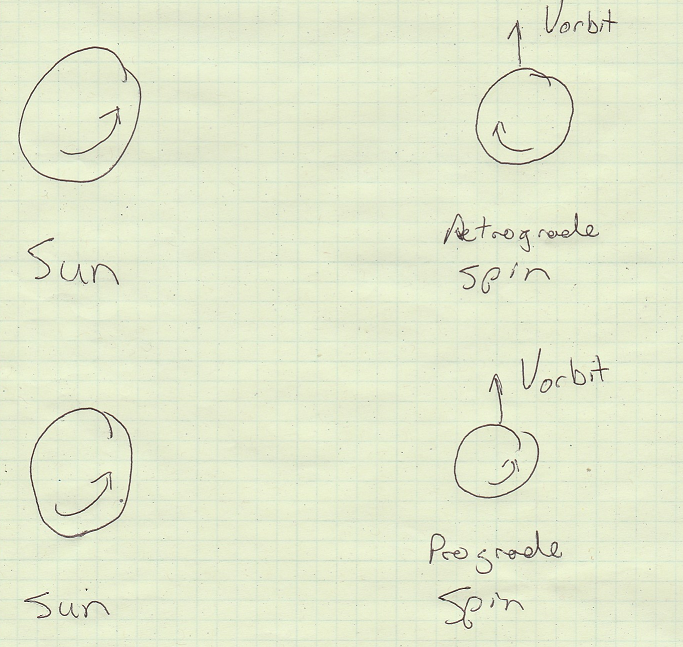 Figure 3: Illustration of Retrograde and Prograde spin along an orbit path at Vorbit. We can also gleam from this mass momentum system that Venus's other orbital characteristics may be detected as changing. As Venus slows down on its axis its wobble may increase. As the mass momentum system of Venus continues with the Sun we may see its orbital eccentricity and inclinations take on larger oscillations and become more elliptical. The orbit of Venus will become less perfect over time. As the days get longer the temperature gradients on Venus's day and night sides will be larger.